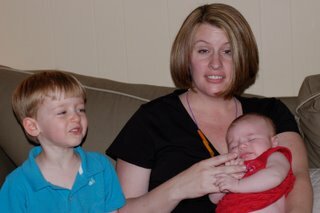 I can't believe I have a three-month-old and an (almost) three-year-old! I still feel like a new mom- like I just had Connor not too long ago. 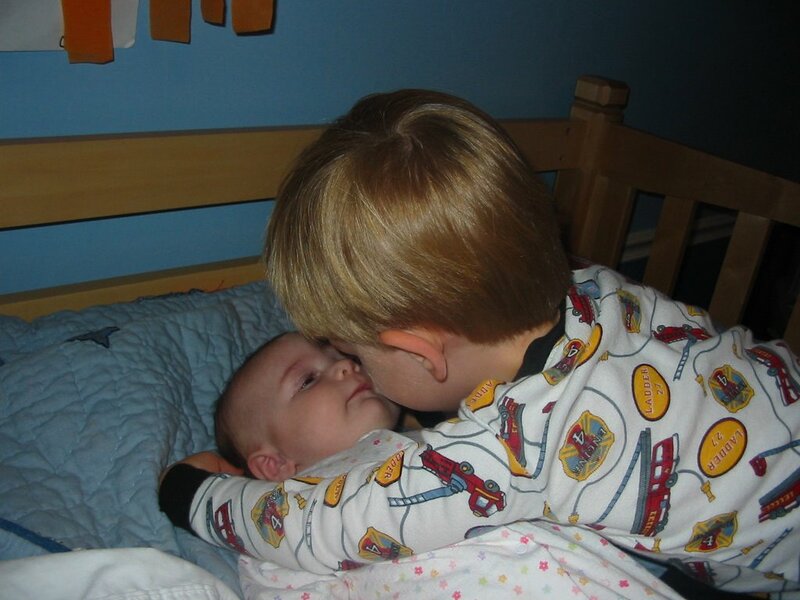 Somehow he's become a grown-up big brother, although I still think of him as my baby. Chloe is starting to be a lot more fun. She laughs, she stares cross-eyed at her fist, and she does a good bit of talking. She still will have nothing to do with "tummy time," prefering to smother herself rather than lift her head. However, when we put her in a reclining position, she tries her best to sit straight up. I guess that means her neck muscles work, but only when she wants them to! I don't know how big she "officially" is, but she had definitely grown a great deal since her two-month doctor visit- and she was already huge then. I'm doing okay- there are good days and bad days. I go feed Chloe her lunchtime botle a couple of times a week, and that helps. But someday I'm going to show up back at the office with a baby in my arms! 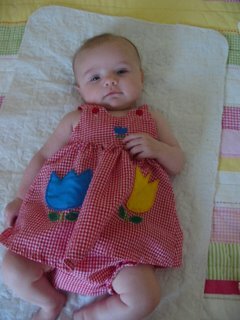 Inspired by Stacey over at Fertile Ground, here are some ramblings. . . Yesterday was my first Monday back at work, so I really feel like a member of the workforce now. Everyone keeps asking me how it is, and I'll tell you- it's horrible! Not actually doing the work- I like my job and my coworkers, so that doesn't upset me. It's everything else that goes with it. I am spending about two hours a day in the car now! Two hours! And Chloe doesn't sleep well at daycare, so she's awake for maybe about an hour total when we're at home. Of course, her awake time usually falls during my mad dash to get ready in the morning, or while I'm making dinner at night. 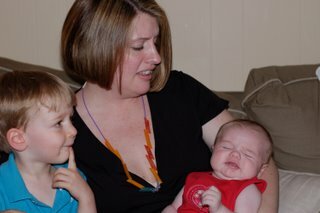 But worst of all is Connor, who was fine with having a baby in the house until I started commuting with both of them. Sharing the ride to school seems to be the straw that broke the camel's back. Did I mention he's in a new classroom on top of it all? So every morning it's a crap shoot as to whether he'll be happy to see his friends, or crying and clinging to me. But there's no guessing game in the evenings- he's going to be a total turd no matter what! I'm hoping the nightly freak out/hissy fit is a phase that will end soon, but for now it is making our evenings pretty miserable. Lucky for him he's still irresistibly cute. Also, getting dressed for work with this post-pregnancy body is pretty depressing. I miss my cute clothes! It's been so long! Chloe's like, "You're sending me to school now? I didn't even notizzzzzzzzzzzzzz." Connor's way of talking has gotten pretty funny lately. He's over "Imam" (I'm am) and has moved on to "because." He starts most sentences with "because," as if he is explaining something to us proactively. "Because that car is red!" Um, okay! He also "just wants to" do everything. "Can we go outside?" "Not right now, Connor." "I just wanted to go outside, Mommy!" Of course, he often combines those two, "Because I just want to watch Little Bear, Dad." (Just reading it doesn't accurately capture it- imagine a little bit of a whine with that.) He is suddenly more confused about pronouns- he still mixes up he and she, but now he will say to me, "You and Daddy and Mommy need to go for a walk with me." His verb tenses are pretty entertaining too, although he is clearly following the right pattern. It's just that "I walk/she walks" works, but "I do/she dos" (pronounced dues) doesn't. Then this morning at Chloe's school, he said, "Let's go, Stephanie." Ha! For the first time, Connor is really aware that his birthday is coming up. 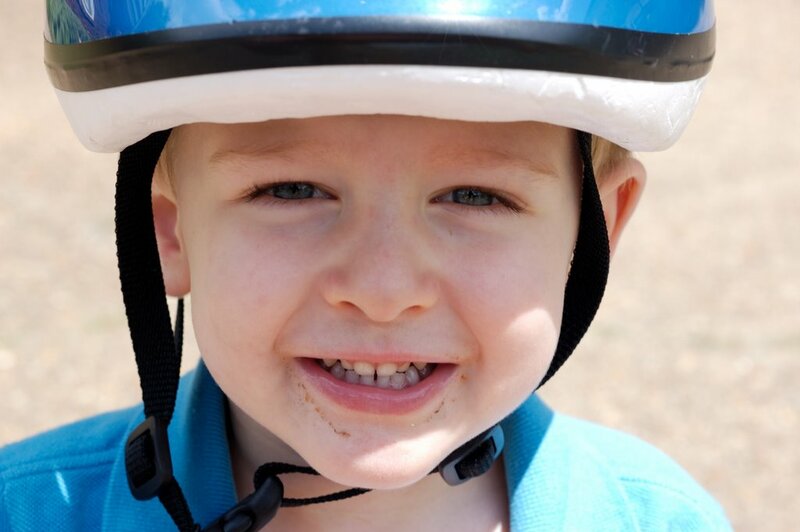 He wants, in no particular order, a car, some swings, a bicycle, and a scooter. He tries to convince us each day that he's grown some, and is therefore big enough for a bike. And not a toy car, but an actual car. 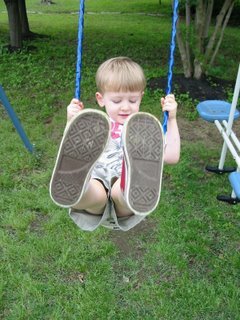 He told me he wanted his own swings while we were on our neighbor's swings, which are pretty much in our backyard. Apparently he needs to have some he can call "mine." I think I can handle buying him a scooter, though. At least I'll get one thing right! Finally, Chip's dad tried to take some pictures of me and the kids on Mother's Day, but they didn't turn out so well.